If you told me this was being offered straight out of the Harrah Collection, I’d believe you. If you’ve ever wandered through the National Automobile Museum in Reno, Nevada, you’d know that the first part of it is full of cars just like this (and if you haven’t, DO IT). Only 400 Packards were built between the company’s founding in 1899 and the end of 1903. Packard offered two models in 1903: one was the single-cylinder Model F and the other was this, the twin-cylinder Model G. It was the only two-cylinder model Packard ever sold and this is the only one left. That engine is a 6.0-liter flat-twin that makes 24 horsepower. Those are some massive cylinders, at three liters a piece. The Model G is a massive automobile: it weighed in at over 4,000 pounds – even with aluminium fenders! Only four of these were built and they were fabulously expensive, with one reputedly going to a Rockefeller. This one has been in this collection for over seven decades and was damaged in a fire some years ago. The body was exactingly rebuilt and, as they say, it “ran when parked.” This piece of Packard history – one of the oldest Packards in private hands – should bring between $250,000-$350,000. Click here for more info and here for more from this sale. 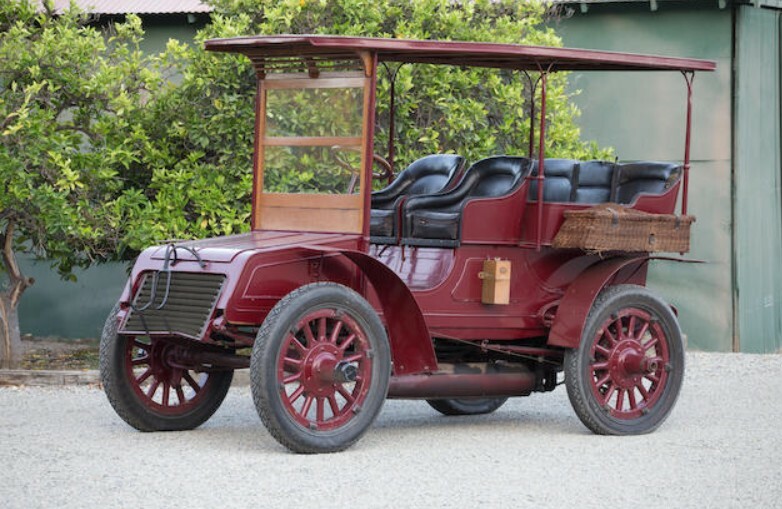 This entry was posted in Uncategorized and tagged 1902, auctions, Bonhams, cars, classic cars, four-passenger, model g, packard, surrey by classiccarweekly. Bookmark the permalink.